As a blogger I’m always on the look out for a subject for my next blog. In my case it is usually something witty ( hopefully) and the word ‘me’ or ‘I’ comes up quite a lot. As I lay in bed last night unable to sleep I was thinking about what I was going to write about for my next blog. It was going to involve what I’ve been doing over the last few days and it was probably going to feature me. And then I thought about where I had been on Monday and I abandoned any idea of being witty and self-deprecating and decided to concentrate on the hours of Monday afternoon. I have to be honest and say I wasn’t looking forward to the event I was going to but I was going with my friend Olive and so that didn’t matter. She is great company and we can talk for hours. Olive collected me at 3p.m. and we headed for Stormont. A car parking space had been pre booked so we didn’t have to drive around looking for a space. After the formalities of getting though security we headed for the long hall. I admired Olive’s purple nails. They looked gorgeous. We took the lift to the first floor where we were joined by Olive’s partner. We had arrived at the launch of Pancreatic Cancer Awareness Month # PCAM . We were early and took our seats. Basil McCrea came and said hello and Joanne Dobson who sponsored the event arrived shortly after. The team from the UK led by David Parke also arrived and after introducing themselves proceeded to set things up. 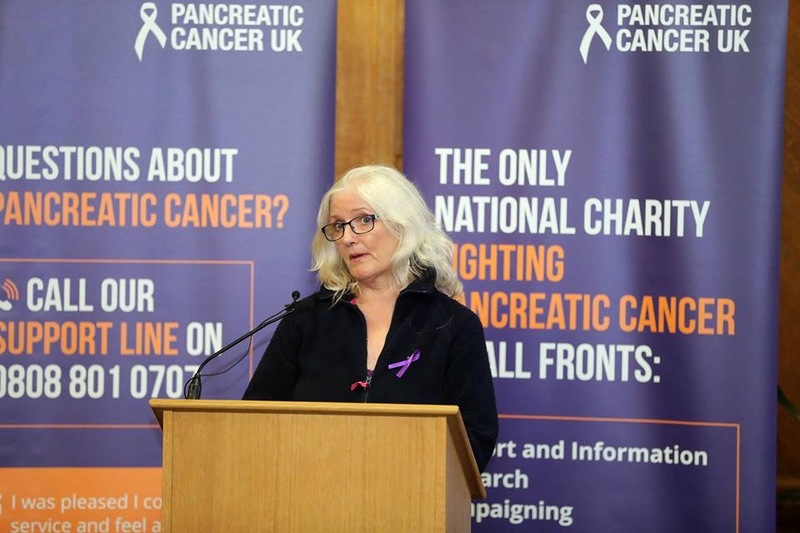 After an introduction by Joanne Dobson, Victoria Poole spoke about how she had recently lost her grandmother due to late diagnosis of pancreatic cancer. She explained that she now worked in PR and was using her skills to raise awareness of the condition and how the symptoms don’t always present themselves until it’s too late. 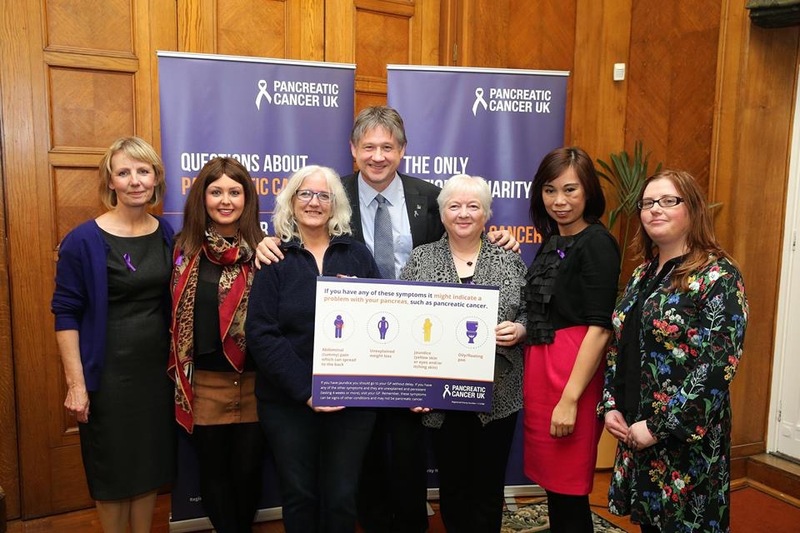 Victoria has become a spokesperson for Pancreatic Cancer Uk in NI. She thanked the large number of MLAs who turned out for the event.To give them their due, there were a large number present. Next to speak was Gráinne O’Neill. 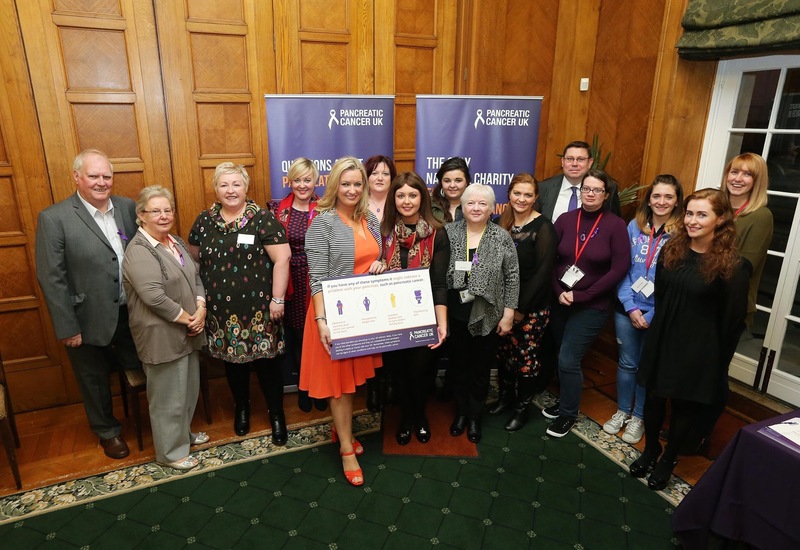 Gráinne recently lost her mother, again due to pancreatic cancer. She talked poignantly about how herself and her siblings were dealing with the loss. Again she highlighted late and misdiagnosis were a contributing factor to her mother’s death. The Northern Ireland Public Health Agency’s ‘Be Cancer Aware’ campaign publicise these danger signals. It is understood that PCUK are campaigning for the symptoms of pancreatic cancer to be included in their ‘Be Cancer Aware’ campaign. Thanks to all the team from the UK who braved the weather to come to Belfast. After a very successful launch we headed out to the cool night air and as we gazed down over the city there seemed to be a purple glow dotted with the orange street lights. * Since writing this piece it has been announced that as of today, the 4th November, the life extending drug Abraxane is no longer available in England, ( through the Cancer Drugs Fund ), to newly eligible patients with advanced pancreatic cancer. ← Ann Allan: A Tale About a Dog.